Estha Weiner is co-editor and contributor to Blues For Bill: A Tribute To William Matthews (Akron Poetry Series, 2005 ), and author of The Mistress Manuscript (Book Works, 2009) and Transfiguration Begins At Home (Tiger Bark Press, 2009). 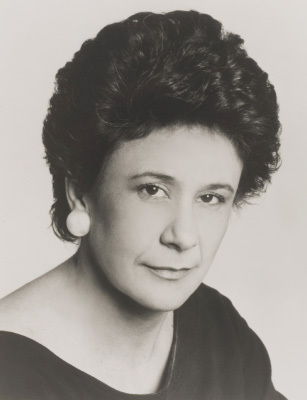 Her poems have appeared in numerous anthologies and magazines, including The New Republic and Barrow Street. Nominated for a 2008 Pushcart Prize, she was a 2005 winner of a Paterson Poetry Prize, and a 2008 Visiting Scholar at The Shakespeare Institute, Stratford, England. Estha is founding director of Sarah Lawrence College NY Writers’ Nights Series, Marymount Writers Nights, and a Speaker on Shakespeare for The New York Council For The Humanities. She is a Professor in the English Dept. at City College of NY, and serves or has served on the Poetry/Writing faculties of The Frost Place, The Hudson Valley Writers’ Center, Stonecoast Writers’ Conference, Poets and Writers, Poets House, and The Writer’s Voice. She also serves on the Advisory Board of Slapering Hol Press, Hudson Valley Writers Center. In her previous life, Estha was an actor and worked for BBC radio. The poems in Estha Weiner’s third collection are arranged in seven sections, which made me think of Shakespeare’s “The Seven Ages of Man” speech in the play As You Like It (1623), although filtered through a woman’s perspective. Simply numbered I to VII, these sections could have been given titles such as Local, Farther Off, Farther Still, Europe, Weather/Nature, Tributes, and Portraits. the New York skyline, the two towers on her daughter’s tiny breasts. Arguably, all writing, even the speculative or journalistic kind, contains some elements of the writer’s own experience. Likewise, the reader brings to the story a personal perspective, sometimes giving the words a twist that the writer was not aware of. This may be most true in poetry, especially that style we term or verges on the confessional. 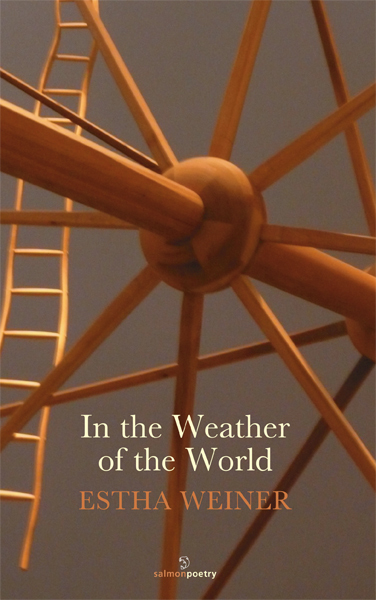 Although In The Weather of the World basically fits that description, several of the poems are conversational without actually being confessional. Using clear, straightforward language, they constitute miniature stories that appear, at first, to be easy reading but are not easily forgotten. “Ritual: South Florida,” for example, is written in the third person and tells the story of an old woman, rather than the lighting of the Sabbath candles, “Every Friday, one dozen roses / to his grave, then / she gets her hair done: in this way she worships” I don’t personally know a women like that, but I know they are down there in South Florida, out in New York’s Brighton Beach, and many other places in the world. tools of the most humane. What does surprise—and move me—however, is how aptly these words apply to my view of Estha Weiner herself as seen through her work.